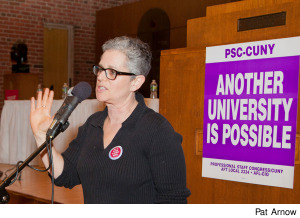 Nearly 350 faculty, staff and students attended a March 8th PSC Town Hall Meeting on Pathways, CUNY’s top-down overhaul of general education and transfer. About 30 people spoke during an hour-long open mic, criticizing Pathways and demanding an alternative. 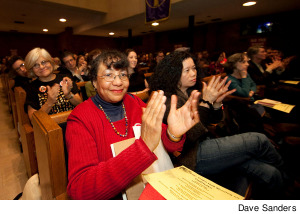 Part of an audience energized and ready to mobilize in the campaign to repeal Pathways. 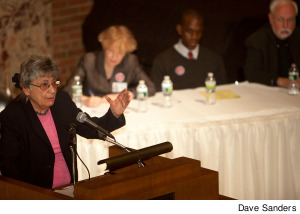 The meeting also heard from PSC President Barbara Bowen; Sandi Cooper and Terry Martell, chair and vice chair of the University Faculty Senate; Jamell Henderson, a senator in the student government at BMCC; Manfred Philipp, professor of chemistry and PSC chapter chair at Lehman College; and Saavik Ford, associate professor of astronomy at BMCC. The campaign for an alternative to Pathways includes a lawsuit, a petition drive, and a possible action at the April 30 meeting of the Board of Trustees. “This is a fight we can win,” Bowen said to applause. Bowen announced that a lawsuit to stop Pathways will be filed within the next 10 days. Plaintiffs in the suit include Bowen as head of the PSC, University Faculty Senate Chair Sandi Cooper and UFS Vice Chair Terry Martell. The lawsuit’s legal team includes PSC Director of Legal Affairs Peter Zwiebach and the law firms of Meyer, Suozzi, English, & Klein, and Emery Celli Brinckerhoff & Abady. 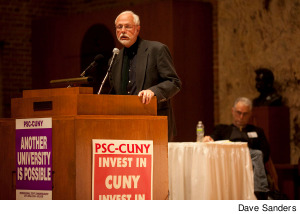 “I can’t think of a better use of [union] resources than standing up for the academic integrity of a CUNY education,” said Bowen. Pathways “is an austerity education, preparing our students for low expectations,” Bowen said –- and students as well as faculty and staff find that unacceptable. Barbara Bowen: We are not powerless. That's why we have a union, that's why we are here together. “We can change Pathways,” Bowen concluded. “We are not powerless. 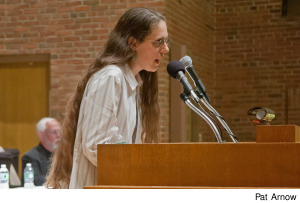 That’s why we have a union, that’s why we’re here together,” she said to loud applause. “We do not have to say, ‘Okay, we hate it, but it’s done.’” By acting together through the lawsuit, the petition, and in further public actions, she said, the outcome can be changed. UFS Chair Sandi Cooper: [Faculty discipline councils] have...written cogent critiques, [warning] of how undergraduate education is going to be destroyed. Terence Martell, UFS Vice Chair: I do not want our students to have less of an opportunity because of some ill-conceived, poorly thought-through and poorly executed plan. Terry Martell, vice chair of the UFS, spoke in personal terms about the decision to go to court. “A lawsuit is not an easy thing,” said Martell. “This is not going to be fun. I don’t look forward to it.” The decision to “put my name, my reputation on this lawsuit,” was not mainly because of issues of faculty responsibility for curriculum, or the expansion of administration control, said Martell – important though those issues are. 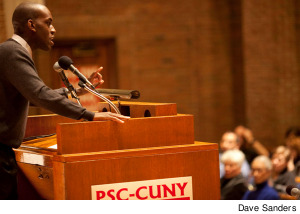 Instead, he said, the key factor was the damage that Pathways will do to CUNY students. Jamell Henderson, BMCC Student Government Senator: [W]e will be such an insurmountable force that the chancellery will have to stand and listen. Manfred Philipp, PSC Chair at Lehman and former UFS Chair: [The response to the petition for repeal] is a game changer for this university. Saavik Ford, associate professor of astronomy at BMCC: Pathways, with its three-credit, three-hour science requirement, cannot provide anything but a substandard education. Steven Jablonsky, Chair, Music Department, CCNY: I am very proud of our school [CCNY] and any diminution of what we do is a crime. When the meeting turned to comments from the floor, the direction of the microphone was symbolic: the mic was set up so that speakers faced the rest of the audience, not just those who had spoken from the stage. This was a chance for CUNY faculty, staff and students to speak with each other about the impact of Pathways, and how to put an alternative in its place. 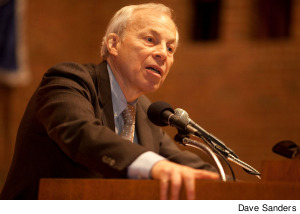 Steven Jablonsky, chair of the music department at City College, noted that he and Chancellor Goldstein had been students together at CCNY and had benefited from a strong general education program. “The core curriculum at that time...prepared us for a life as citizens of the city of New York,” Jablonsky said. “It also prepared me to go to Harvard University and be on equal footing with anybody from anywhere in the country. It prepared me to be a professor at the greatest college in the city of New York and in the country. And I am very proud of our school and any diminution of what we do is a crime. 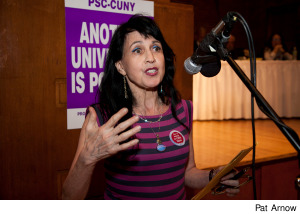 Hollis Glaser, professor of speech, BMCC: [Faculty members] are pitted against each other in this [Pathways] process, fighting for turf and fighting for student credits. [The result] has been a horrible process. 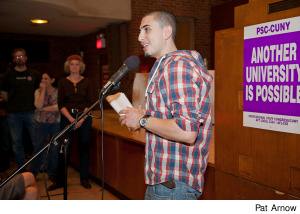 Amir Khafagy, LAGCC student: [Pathways] is a cop-out, an excuse to give students a cheaper, poor quality education. Nivedita Majumbar, acting PSC Chair, John Jay: If Pathways is so wonderful, how come we do not see similar initiatives at Harvard, at Columbia, at NYU? 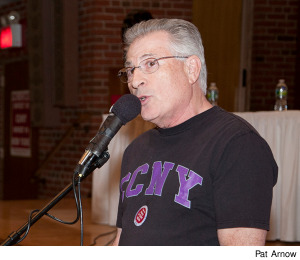 Several speakers urged faculty on college-level Pathways committees to vote to approve only courses that they believe meet the educational needs of CUNY students. 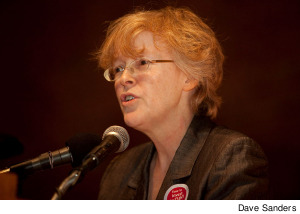 Gail August,associate professor of English, ESL and linguistics, Hostos Community College, criticized "the myth of faculty input." “This is a moment in which there is some real hope for taking action,” said Barbara Bowen in closing the evening’s discussion. “We have an important beginning tonight. We will demand nothing less than the repeal of Pathways and its replacement by an alternative.” The large room buzzed with conversation as faculty, staff and students headed out the door. On the way out, they picked up hundreds of copies of the petition to take back to each of their campuses. By the following Monday the number of signers had passed 3,000 and was still growing.